This book has been produced by the United Nations. High Commissioner for Refugees. Section one Summarizes UNHCR's mandate of international protection and the aim and principles of emergency response. Section Two Deals with emergency management. Section Three Covers the vital sectors and problem areas in refugee emergencies, including health, food, sanitation and water, as well as key field activities underpinning the operations such as logistics, community services and registration. The chapters in this section start with a summary so that readers, who might not need the full level of detail in each of these chapters, can understand the basic principles of the subject quickly. Section Four Gives guidance on the support to field operations, primarily administration and staffing. The Appendices Include UNHCR's Catalogue of Emergency Response Resources, which set out what resources can be immediately deployed, and how and when. The appendices also include a "Toolbox" which gathers, in one location, the standards, indicators and useful references used throughout the handbook. 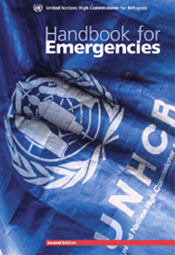 In addition to the Catalogue of Emergency Response Resources, another key companion reference is the Checklist for the Emergency Administrator to which is annexed many of the essential UNHCR forms, policy documents, and guidelines referred to in this handbook, which are necessary for the administrator setting up a new office. Another key companion reference is the UNHCR Manual - this is valid at time of going to press; however, chapter 4 of the Manual dealing with program and project management is due to be updated and replaced by the Operations Management System Field Manual.